Some systems of implicit equations can be solved algebraically while some are easier to solve by graphing. Algebraically, the solution to a system of equations is the points that satisfy all equations. 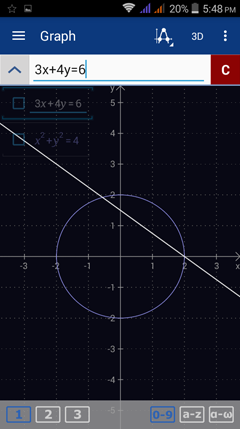 On a graph, the solution is the intersections of the curves. 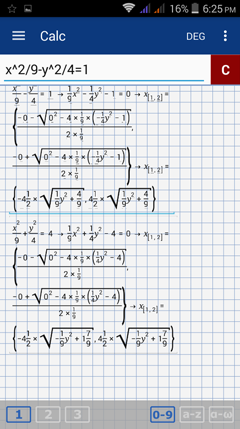 To solve a system of implicit equations, type the equations as they appear in the problem with one equation per line. If no answer is shown, the system is easier to solve by graphing. In this case, switch to Graph mode. Solve each system of implicit equations below. Enter the first equation: 3x + 4y = 6. Type the variable y by tapping the x variable key twice. Hit enter. Enter the second equation: x^2 + y^2 = 4. Note: The answers shown are the values of the dependent variable y.
y = 48/25 = 1.92. Type y = 0 and then the equation you want to use. E.g. y = 0, then 3x + 4y = 6. 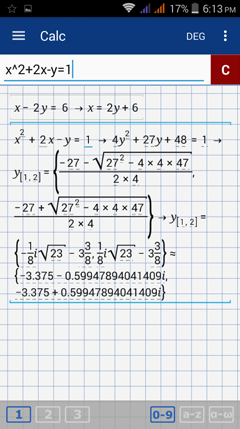 To find the value of x when y = 48/25, edit y = 0 and change 0 to 48/25. 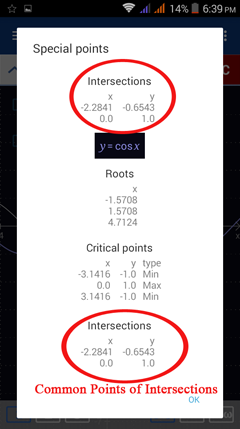 Switch to Graph mode by selecting Graph​ from the navigation menu. Tap the special points key. 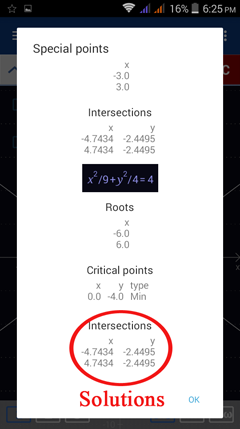 Check the "show intersections" option. 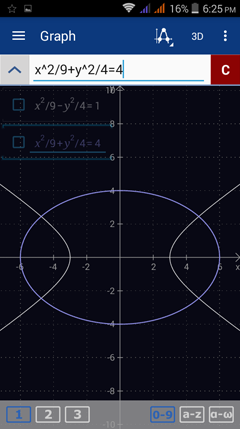 ​Enter the first equation: xy = 4. Type the variable y by tapping the x variable key twice. Hit enter. Enter the second equation: 2x + y = x^2. 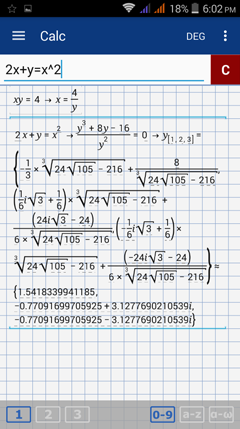 Note: The values of y shown are imaginary numbers so it's easier to solve the system of equations by graphing. See the graphical solution. 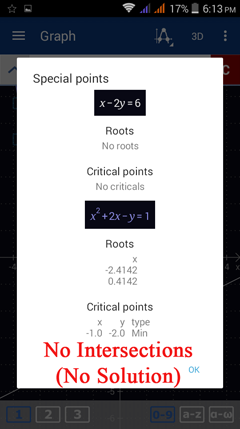 ​Switch to Graph mode by selecting Graph​ from the navigation menu. Enter the first equation: xy = 4. 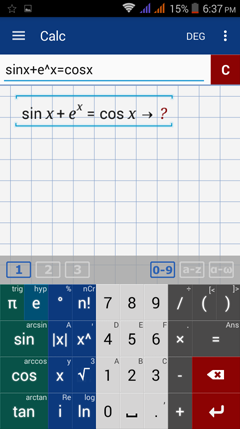 Type the variable y by tapping the x variable key twice. Hit enter. Enter the first equation: x - 2y = 6. Type the variable y by tapping the x variable key twice. Hit enter. Enter the second equation: x^2 + 2x - y = 1. Note: The values of y shown are imaginary numbers so it's easier to solve the system of equations by graphing. Note: The two graphs do not intersect. There is no real number solution to the system of equations. Enter the first equation: x^2/9 - y^2/4 = 1. Type the variable y by tapping the x variable key twice. Hit enter. Enter the second equation: x^2/9 + y^2/4 = 4. Note: The calculator displays the values of x in terms of y so it's easier to solve the system by graphing. 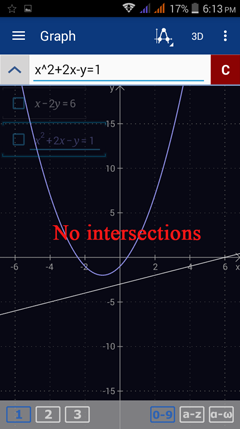 Note: The points where the graphs intersect represent the solution to the system of equations. Enter the equation: sinx + e^x = cosx. 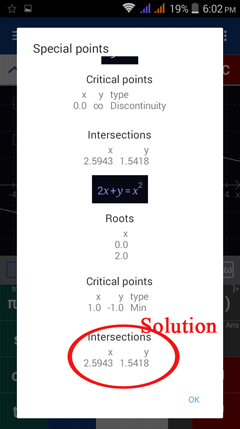 Note: The calculator does not display any results but it doesn't mean there is no solution. To solve the system, change the equation into a system of equations: y = sinx + e^x and y = cosx. 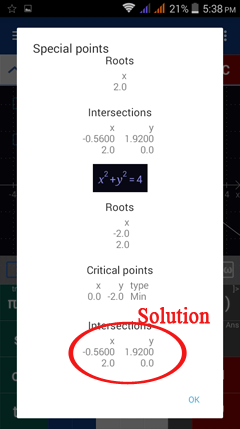 Find the solution by graphing. Enter the right-hand side of the equation: sinx + e^x. Hit enter. Enter the left-hand side of the equation: cosx. Note: The intersections of each graph are shown. The points of intersection represent the solution set.